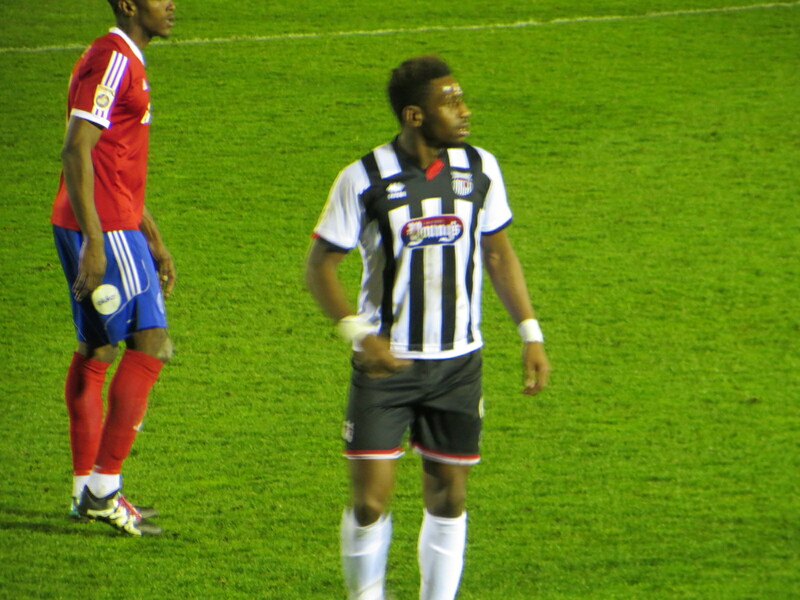 Bogle at Aldershot in April 2016. In the dying minutes of the January transfer window Wigan Athletic signed Grimsby Town centre forward Omar Bogle. The transfer fee is reputed to be in excess of £1 million. 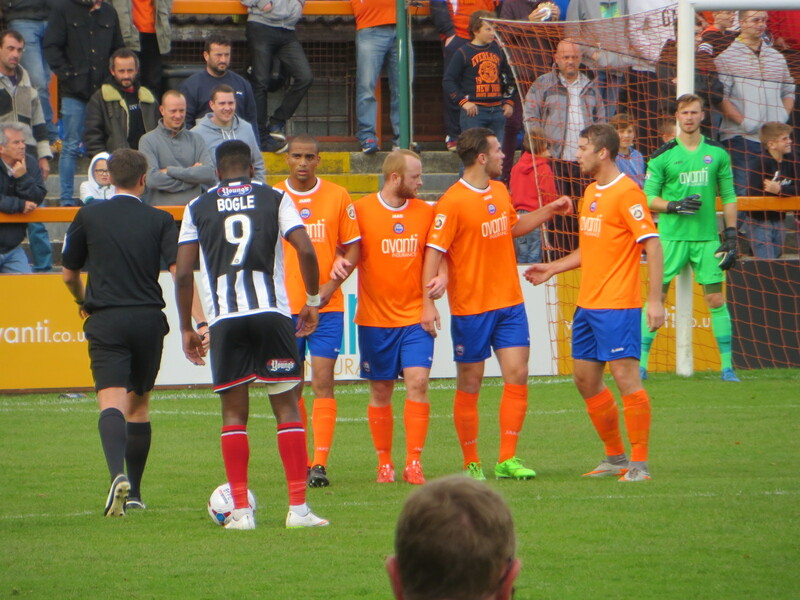 Bogle lines up a free kick against Braintree in October 2015. The 23 year old Bogle, who is 6 ft 2 in tall, was born in Birmingham. After being with West Bromwich Albion’s youth system in his early teens he passed through the Birmingham City Academy before joining the Celtic Academy for a year. After a one year spell at Hinckley United he joined Solihull Moors where he went on to spend three years. In 2014-15 he was the Conference North Player of the Year, being top goalscorer in the division with 29 goals. Bogle scored 62 goals in 111 appearances for the west midland club before signing for Grimsby Town in summer 2015. He went on to score 16 goals in his first season, including two against Forest Green Rovers in the National League playoff final, which Grimsby won 3-2. Bogle started the next season well, being League 2 Player of the Month in both August and September 2016. He went on to make a total of 68 league appearances for Grimsby, scoring 32 goals. In order to learn more about Bogle we contacted Paul Ketchley. Paul is a regular contributor to the independent Grimsby Town fanzine Cod Almighty. Paul not only gave us his insights through a Q and A session, but sent us the photos featured in this article. As you know we picked him up from Solihull Moors for something around £30,000. Last season he and Padraig Amond (now at Hartlepool) struck up a partnership that went together like haddock and chips. That’s the way it should be by the way. They are why we are back in the League. Have Wigan paid over the odds? We think that you’ve got him at a bargain price! If it’s between £1 million and £1.5 million he’s worth at least that. We hope we’ve got a big sell-on clause in the deal. Will he do any good in the Championship? Providing you play to his strengths he’ll terrify opposition defences. He likes taking free kicks by the way. Can Wigan send him back if they don’t like him? There’s nobody at our end who is glad to see him leave. We realise that this is how football is these days. So, Omar will be welcome back any day. How do you welcome him? Start playing Blur’s “Tender is the Night” to practice the Omar Bogle anthem. The “oh, my baby” bit.